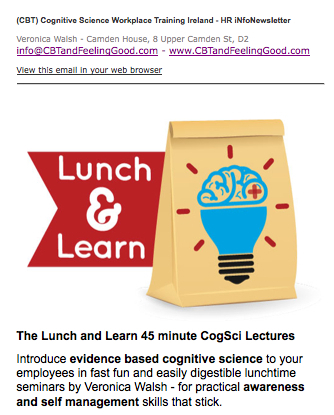 I am Veronica Walsh – I am a cognitive science and cognitive behavioural trainer – and owner of www.CBTandFeelingGood.com brainskills psychological training. I started CBTandFeelingGood in 2009. 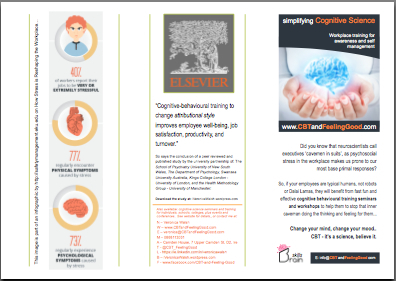 My mission was to provide best practice cognitive behavioural therapy (CBT), but with the focus of turning therapy into accessible and practical learning. My background as a corporate trainer gave me transferable skills that clicked perfectly with CBT, especially in the area of creating user friendly worksheets and handouts for clients. In fact my materials are used by mental health professionals all over the world. My programmes were accredited for inclusion on the national register of trainers, so I progressed quickly to not just working with individuals in my private practice in Dublin’s Camden Street, but also offering cognitive behavioural training well being presentations and group workshops to organisations and companies – working with everybody from banks to government funded bodies and schools and universities. I constantly research and study and apply – and of course the last few years have moved the mental health models in to neuroscience, neurobiology, and evolutionary psychology – and that is blended into my training. And you’re reading this here on my free online self help resource website, which I created in 2012, and where you can access my original downloadable materials, so you can see I provide theory and application homework that moves through various models. I read everything so you don’t have to! Note: I add to it regularly so please feel free to sign up to receive alerts to new posts. This kind of therapy is recommended for low to moderate anxiety and depression, or as a complementary treatment if medication and more traditional therapies have not helped you. You just bring yourself along to a session and I’ll take care of everything else. For engaged learners you won’t have to wait months to understand and apply and start getting obvious results; in fact it can be immediately life-changing for many clients. 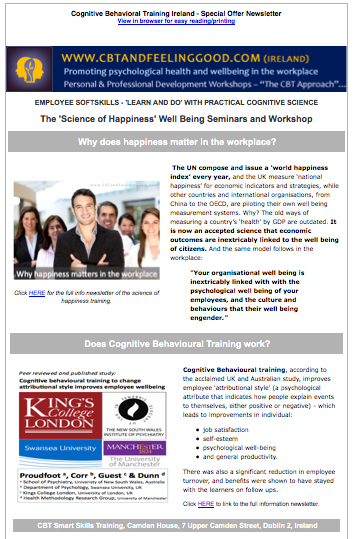 Methods: my work takes a holistic third wave approach, using everything that works – from pure CBT foundations in exploring evidence based practical applications to build awareness and management of how we think and feel and behave, to the neuroscience of our feelings, to positive psychology, to mindfulness and acceptance, and to living in the present practices. The posts and worksheets available on this blog span all of those modalities and more, and each in person session or training workshop is organic and tailored specifically to the client and their particular needs. I share the view of leading academics in psychology and neuroscience that modern psycho-educational models should be efficient and fascinating science of wellness training, not like the old ‘sickness’ models, and that the therapy should deliver early measurable results through a working partnership. My past life thumbnail bio includes: corporate trainer & training manager for AppleCentres (including creating original documentation) – through to running the Dublin Applecentre as managing partner – then leading a digital media startup through Enterprise Ireland, along with general management consultancy including facilitating high end tenders – then becoming a licensed NYC realtor for high end Manhattan property while I was retraining in CBT and experiential training accreditation. Click to read my Herald interview about recession anxiety. Click to read the Irish Times article about my workshop for unemployed. Click to listen to my radio interview about using CBT in the workplace on the Newstalk Breakfast program. NOTE – I also teach Mind Mapping as part of my ‘change your brain and how you do things’ skills. Mind Mapping is a way to map and organise information visually onto a page for easy storing in, and recall from, your brain. 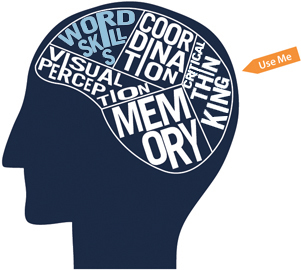 80% of us think visually – so your brain prefers to work this way rather than the linear note-making and learning by rote way you learned in school – Mind mapping is efficient and will make your life easier – organise and plan what you want to say, and recall it easily and clearly. Click HERE to go to my mindmap web page. For more information, (and/or to book a session or training or an appearance at an event or an interview), email me at info@CBTandFeelingGood.com, or call me at Ireland 086 8113031. 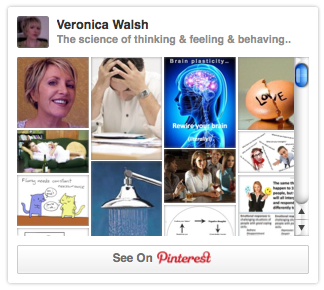 Follow Veronica Walsh’s board The science of thinking & feeling & behaving.. on Pinterest. Ireland Links: private one-to-one sessions (in Dublin’s city centre), and group workshops for organisations and companies. I liked your posts about CBT. I’m glad you quote from Epictetus. My own area of interest is the relationship between Stoicism and CBT, something I’ve written a book and several articles about. (The book’s called The Philosophy of Cognitive-Behavioural Therapy.) Have you looked any further into the Stoic philosophy? Hi. Thanks for that. No, I only have a superficial knowledge of the Stoics. Will look out for your book when I get time to indulge myself by getting stuck in. Greetings from Washington, DC. I would like permission to use your handouts, particularly the called “Looking and our common thinking errors…”. I work at a clinic for people who are grieving a loss. Hi Lynda. Yes, please feel free to use them, (I’m delighted, once they’re not for resale or profit – and once my branding/their source appears on them). And I’d love some feedback on how they’re received if you get time. Best regards, Veronica. Veronica – How do we go about getting permission to use hand outs from you website? In return, it would be great if you could leave a comment/testimonial on my downloads page. And feel free to keep in touch and let me know how you’re getting on. As a therapist I am always looking for new ways to introduce CBT to my clients. Your worksheets are very clear and self explanatory. I would love permission to use them with some of my clients and would be happy to leave comments as my clients progress. Your website and handouts are fabulous. I am a counselor in Lexington, South Carolina, USA. Could I have permission to use the handouts with my clients? I have enjoyed looking through your website. I find your handouts easy to understand and like the freshness. The Pinterest pin looked fun and then, clicking to your website–you’re Irish, and that explains a lot. May I use these sheets to help teach some of my supervisees? I am a clinical social worker in Arizona and appreciate your approach. I would like to incorporate some of them into my work with clients and would not rebrand but would give you full credit. You have done a nice job here! Love your handouts. May I please use them with some of my clients in therapy? Hell Veronica, I would like to utilize your work sheets with individuals I work with daily in the mental health field.